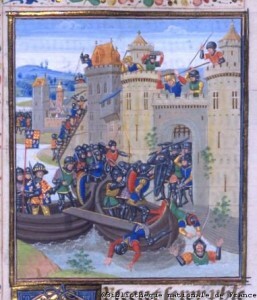 The naval battle of Sluys, the first major conflict of the Hundred years War, was fought on 24 June 1340. By the end of the day-long engagement which was described by many chroniclers using the adjectives ‘grand and marvellous’, ‘most atrocious’, ‘terrible’, ‘great’, and ‘most harsh, the French had been soundly defeated. They had lost nearly all of their ships and, according to contemporary sources, between 20,000 and 40,000 men including both admirals. English losses were substantially less, recorded as being between 1,400 and 10,000. News of the English victory at Sluys spread quickly. Edward III and his men celebrated aboard their victorious ships, as Jean Froissart reports, ‘making much noise and great joy from the instruments which they had brought’. The news of victory was equally celebrated in the Low Countries and in England. The English had won the first major engagement of the war against France, a kingdom which they hoped would quickly be conquered and the rightful king, Edward, restored to the throne. The Low Countries had moved a large footstep forward in their command late medieval march to independence from France. This entry was posted in Articles and tagged 14C, Battle, battles, England, France, Low Countries, Siege of Tournai, social history, Strategy. Bookmark the permalink.